By using concrete forms video games can bridge a game fictional world with the player's experiences from the real world to create a deeper sense of immersion and greater ease in the learning process. We've already covered organic and abstract mechanics. Inorganic design is very similar to abstract design. Abstract mechanics often influence level design that diverges from organic forms, mechanics, and gameplay.The main difference between inorganic and abstract design is that inorganic design is made up of concrete/organic game elements. How these elements are arranged create artificial environments and more restricting gameplay. Now it's time to cover level design. In order to figure out where a game's level design falls on the organic spectrum, you have to examine the game elements at work. The form of each game element must be compared to the forms of the surrounding elements. Seaweed, bubbles, fish, and squid all belong in water environments. Unless the game's fictional world is explicitly defined as one where such water elements can exist in non water environments, seeing them on the land would be an example inorganic level design. In the examples below, I've highlighted a few strange combinations of level elements from Super Mario Bros. Fortunately, the form of the CheepCheep and the fire chains support their placement in the levels and their functions. Fish at this altitude? Good thing they're flying fish. 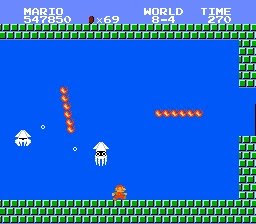 Well, Mario's Fireballs work underwater. And the fire chains are made out of fireballs. This is pushing it. A football player dancing on a block in the sky. Beyond the forms of the game elements, the arrangement of "native" level elements can be inorganic. 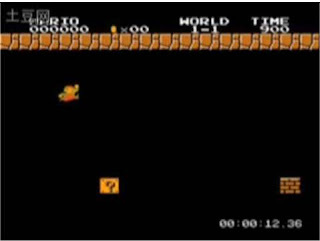 Take the bricks/blocks from Mario as an example. 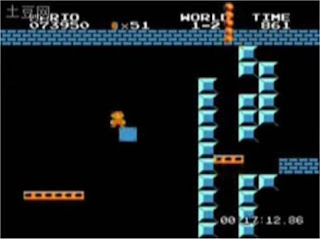 According to the fiction of Mario and the trend created from the beginning levels of the game, bricks/blocks are used to build structures. 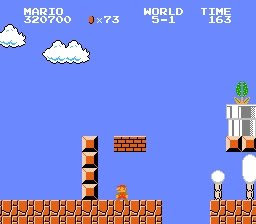 Whether the structures are flat platforms, stair steps, or walls, the bricks/blocks in Super Mario Bros. are organically arranged to stack on top of each other complying with their form. 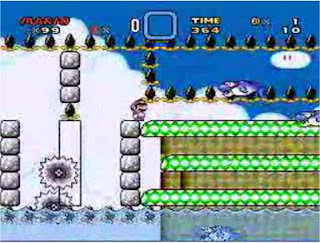 Additionally, the levels in Mario are created out of these structures while leaving plenty of room for Mario to walk, run, and jump around. This creates the sense that these levels are places that a person could have actually built and or traveled through. This is normal. Everything is stacked together nicely. I could take a vacation to world 5-1 and walk around. This is pushing it. As you can see, the gap distance exceeds 6 bricks. Certainly any realistic world wouldn't be mostly pits. Due to the mass popularity of the Mario platforming games, there have been several mods created out of these games. Some mods show off the game's lighthearted physics as examples of vibrant gameplay that sort of plays itself. Others take that same idea and create music out it. Others still design ultra difficult mods that turn the gameplay from focusing on freedom and expression to being a strict, linear progression requiring a mastery of the most nuanced techniques and glitches. The floating pinching enemies are just one factor that make this mod extremely inorganic. It's hard for the sake of being hard. The platforms on the right are moving up toward the fire chain. To get through this section, the timing is pretty precise. No chance for error. No opportunity for freedom/expression. Just one look at these levels and it should be quite obvious that these mod were designed to be difficult at the expense of organic level design. Not only are the level and enemy elements inorganically arranged, but the gameplay is less organic because some of the techniques that are necessary for progressing through the level are abstract techniques that go against the information provided by the game's form. 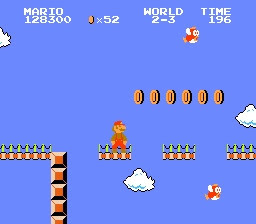 For example, in the Super Mario Bros. players can jump in mid air at the very start of level. Because Mario doesn't have a mid air jump normally, this hidden ability makes the required use of this technique quite extreme and inorganic. The flow in Super Mario Brothers is completely broken up and replaced by route memorization in many of these mods. Players can no longer go with the flow as the scroll speed and game speed present them with the necessary information to progress without taking any blind jumps or inaccessible risks. In these mods, players will die over and over again because of the inorganic level design. With inorganic level design, everything feels like it's put in front of you just because. In such examples, you start to feel that the level is arranged the way it is only so that the player can complete it. In other words, the design doesn't create or sustain a believable game world/fiction. Another example of inorganic level design can be found in games like Metal Gear Solid 4. 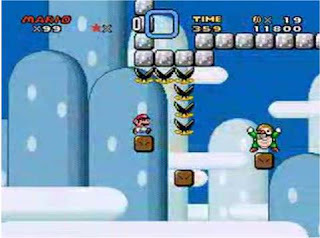 Though Snake has a myriad of skills and abilities that help him traverse his surroundings, there are some small walls that the game won't allow the player to jump over. According to the forms of the game, Snake's inability to surmount a small wall seems awfully silly. Any kid 3 feet or taller can climb up and over such a wall, but for some reason Snake can't. The developers didn't include this ability for this particular area in Act 2 because they wanted players to worm their way up the mountain pass. Perhaps they should have found a more organic way of designing the level/scenario. It's the same in RPGs when a chair or a small rock blocks you from entering an area. Many times, the characters in these games have the ability to cast earth shattering magic or summon creatures that can accidentally punch holes through buildings. Yet, a small obstacle blocks progression. In one scene the characters can't jump across a 2 foot wide river, and in the next they're sliding down tight ropes from an airship with ease as if they were barefoot surfing. Being challenged or restricted by such minuscule obstacles is frustrating because of their inorganic nature. Playing through inorganic elements in general is a type of deconstruction. It's a shame when a game works hard to establish a fiction and a form only to take away from it by arranging levels that don't make sense according to that fiction. It seems like the developer, cactus, was trying to make an extremely inorganic game, ie. it tested the brain with little puzzles that go against traditional game logic. It did claim that it used dream logic, which could be an argument that it is organic, but it never really described what that logic was. Some of the puzzles were very traditional as well, so it wasn't all extremely strange. I'll have to give this crazy looking game a try very soon.